from Pasture to Park, an example of the conversion process of Paddock to Lawn. 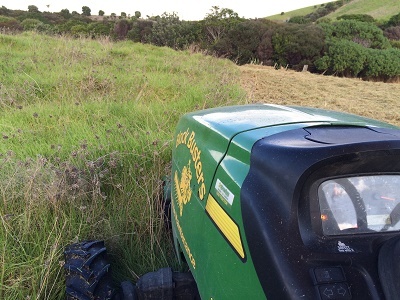 If you want to convert your paddock or pasture to lawn, this article could be of some interest! The client wanted us to reclaim the paddock the previous owner had been using as a Mandarin grove and transform it into a beautiful lawn. Usually we start with a mulch mow to clear any heavy gorse or grass but as this was a well kept piece of land we could skip straight to rotary hoeing. Pre-spraying wasn't necessary either as the grasses present would complement the new lawn. Pasture generally becomes quite pitted and rough over time. Animals tend to graze fixed patterns, (especially when on long term grazing rotations), and ledges and tracks evolve on slopes. If the pasture is flat, you will encounter holes and bumps - all of which makes mowing with a "ride-on" a very interesting and slow exercise! In this case, there were regularly spaced holes where the stumps had been ground out. So, to minimise this issue, it is necessary to do some land shaping - knocking off the bumps and filling the holes. Deep rotary hoeing is the start of the smoothing process. Where necessary, topsoil can be pushed aside to enable extra smoothing, then re-spread and smoothed before sowing the grass seed. 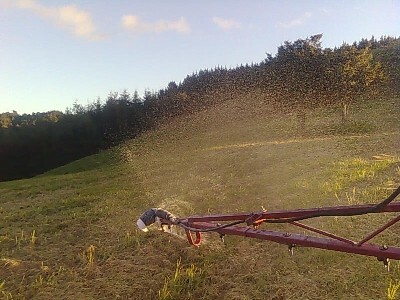 Sowing the grass seed can be achieved by either direct placement or broadcast spreading, (oversowing). Hoed, Sowed and ready to grow! A quick note for your new lawn - any disturbing of the soil will stimulate long dormant seeds into germinating amongst your new lawn seed - don't panic - this is normal! It takes several seasons of loving care to see the full results - treatment of weeds can include selective sprays, individual plant removal, and good feeding. Also, DON'T ever mow your lawn too short - this encourages weed growth. Best to cut no shorter than 40 - 50mm. All the soil surface should be shaded by grass leaves all the time - cutting too short allows the sun to strike the soil and overheat it - encouraging weed growth. Here, mulch mowing has started, (mulched grass to right of frame) - you can see how heavy the growth is by noting how high the grass is at the front of the tractor - 0.7-1m in this case. 3 weeks later, we did a complete spray off to kill all the existing pasture grasses and weeds currently growing. The black cup on the end of the boom is a foam marker device that normally leaves a trail of white foam blobs to mark the edge of the "run". This helps align the next pass to avoid overlaps or missed strips. This avoids embarrassing mistakes, such as when you come back to check in 4 weeks and see long green strips where there should be treated pasture, (i.e. brown and dead in this case). Spraying is a real technique that takes time and experience to perfect. Calculating nozzle pressure, flow rates versus speed and so on, can get really tricky. With all Agrichemicals, accurate coverage rates are super-critical. A mistake can waste hundreds of dollars worth of chemical, or, worse, have a detrimental outcome to your land. A good point to remember here is non-systemic sprays are designed to kill plants that have greenery above ground. This is desirable as the more long-term effect sprays effectively sterilise the soil, and many months will pass before you can successfully plant your lawn seed! 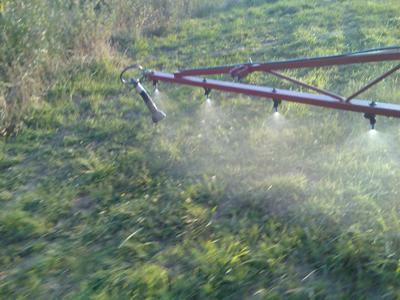 Please note: All Block Busters staff who apply spray are certified Agrichemical handlers. Any questions? Feel welcome to contact us anytime!